Large starving colonies of bees will take 1 gallon (approx. 5 Litres) of syrup very quickly while smaller colonies will take half a gallon (approx. 2.5 Litres). After feeding, heft the hives again and check the weight and if in doubt feed some more in a few days. Please see the notice below from the National Bee Unit. Some of you may not have gotten round to treating your colonies with oxalic acid as the weather was so mild in winter. 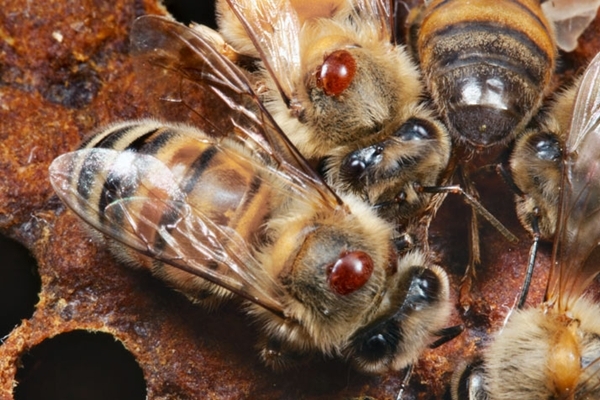 Treatments that were applied in winter may have had lower than normal efficacy due to the presence of brood and therefore beekeepers may want to consider treating colonies again, especially where bees are showing signs of deformed wings. Thymol based products and formic acid pads may be ineffective at the present time as daytime temperatures respectively of 12-15 °C or above are recommended. Neither should MAQS strips be used on smaller colonies. Therefore contact strips such as Apistan or Bayvarol may be beneficial, these offer a rapid knock down in severely infested colonies. However, resistance to these products has been reported in some areas and therefore colonies will need to be monitored after the treatment and an alternative treatment applied if necessary later in the season. Alternatively, Apivar & Biowar (Amitraz) are available under the EU Cascade system by using a special import certificate. For more information about this, contact your local vet. The vacancy for Seasonal Bee Inspector for North Pembrokeshire and South Ceredigion is now live on Civil Service Jobs here. The closing date for applications is 5th April 2016 if any PBKA member is interested in applying. As from today, the current Seasonal Bee Inspector vacancies are now live on the Civil Service website. Alternatively you can go to: www.civilservicejobs.service.gov.uk and search on the vacancy number which is 1448521 or by role which is either: Operational Delivery or Veterinary Services. The vacancy in Wales is to cover North Pembrokeshire and South Ceredigion and the closing date for applications is 17th April 2015. Frank Gellatly, the Regional Bee Inspector for Wales, has indicated that he would be happy to answer any queries. A reminder that the Bee Disease Workshop organised and presented by the National Bee Unit is taking place this Saturday June 14th. Workshop starts at 2.00 pm and ends at 5.00 pm. Taking place in the Picton Community Centre, Freemens Way, Haverfordwest, SA61 1TP. Bee health is important and this event is open to any beekeeper who can attend not just members of Pembrokeshire Beekeepers’ Association, no need to book. This is not suitable for non-beekeepers. We are grateful to Bee Disease Insurance (BDI) for their financial support in sponsoring this workshop.